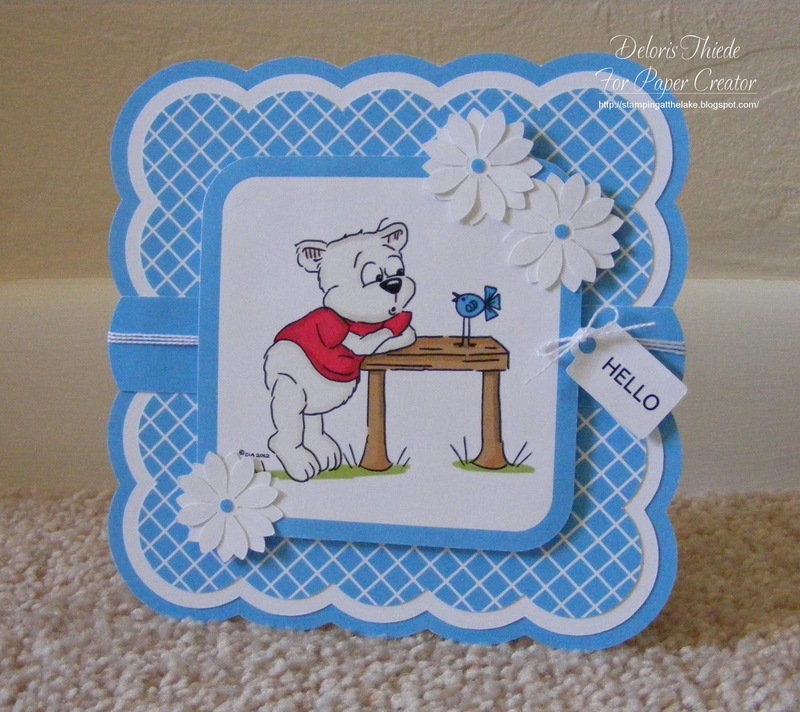 I hope you can join us for the new "Anything Goes" challenge starting today at Paper Creator. I love this darling precolored digi image called Bently Bears Bit Of Gossip. You can find it HERE at the Paper Creator store. I created the diamond print paper in GIMP using a template from Melstampz. Created the scalloped card base using cut file 10396 from the Silhouette store. (Resize the largest scalloped square to be 5 X 5. Make a copy, then mirror above, overlap, then align image. Merge all layers to form the card base.) Colored all the layers with Studio, printed, then cut them out with my Cameo. Attached all the layers to the cardbase. Added some twine, then attached the Bently image with pop dots. What a cutie patootie bear. love the cuteness! Love the bright blue and white colour combination. Awesome detailed layer of die cut. Great card. Thanks for joining in Simon Says Stamp Anything Goes Challenge! Wow...you are really getting into so much detail with Silhouette and the coloring. I've done some but shadowing is a little hard. Anyhow, the card is precious and fantastic. Love how you curved the solid blue to wrap for detail. I'll have to check out the store for image and remember your code. Ps..I bought the shadow box card like you sent me...can't wait to use it. A super card Deloris, such an adorable image and lovely blues. Oh I love the blues on your card. You whipped up a beauty!!!! Great shaped card. Love Bentley there having a gossip. Thanks for sharing in our 'All creatures great and small' challenge. Oh yes...looks like a little gossip or words of wisdom going on. I have GOT to check out that link on making that diagonal design paper. FABULOUS!! !